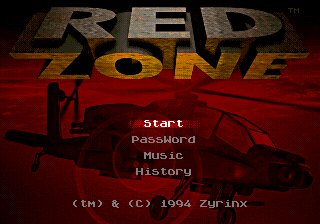 Red Zone, known as Hardwired during development and Commando Raid when demonstrated at Summer CES 1994, is a Sega Mega Drive game released in 1994 by Zyrinx. It is noteworthy for achieving sprite rotations, 3D vectors and full motion video; things that were often considered impossible to do on Mega Drive hardware. No additional hardware (such as an extra chip in Virtua Racing is used. The game proudly announces this technical achievement before the title screen. Zyrinx were previously responsible for Sub-Terrania, and the two games share similar graphics and logos. The soundtrack was again composed by Jesper Kyd. The player controls an AH-64B Apache helicopter in an attempt to stop the dictator Madman Ivan Retovitz from taking over the world. The helicopter has both a normal gun (fired with ) and a variety of weapons (fired with and switched between with ) that target a crosshair that is at a fixed distance from the front of the helicopter, which can be steered with the D-pad. Around half of the game consists of flight missions. Armor, weaponry and fuel need to be replenished by picking up items (marked with letters on the games map, accessible via the button. There are also on-foot missions, with three selectable soldiers. In this mode, the game also uses a lot technical tricks to simulate a 3D environment similar to e.g. Loaded on Sega Saturn. A defeated character is permanently dead. Overall the game is rather puzzle oriented. Strict ammo limits and low health as well as limited fuel require a well planed approach. A password system is used to record progress. The game has no score system. Main article: Red Zone/Magazine articles.